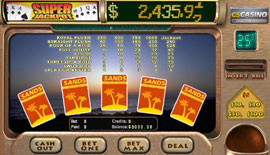 There are two progressive jackpot video poker games at CS Casino. One $0.25 and a $1 game. The game rules are the same as Jacks or Better. To be eligible to win the progressive jackpot a max bet of 5 coins is necessary. So to win the big Super Jackpot you need to bet $5 and for the smaller Super Jackpot a bet of $1.25 is required.